Quebec artist François Morelli and I have been working together since 2010. 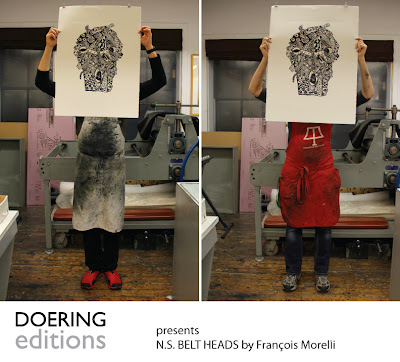 He needed someone to translate his large and intensely textured ink drawings of belt heads into linocuts. After hundreds of hours of carving we printed the first four belt heads by hand in his studio last year. Photos of that adventure can be found here. François creates his drawings directly on linoleum and I proceed to carve them meticulously. We then print them together. When my husband and I moved to Nova Scotia in 2012, we took François' newest drawing on linoleum with us and I continued to carve. Over the year, another large one and four smaller blocks followed. Since the spring of this year, François and I had been planning to bring him to Nova Scotia for a session of printing. I discovered that NSCAD University has a very large printing press which fits the most recent blocks. We negotiated and after discussions NSCAD was interested in letting us print in their facilities and combine it with a visiting artist talk/exhibition. On November 12 François arrived for his 12 day stay to realize and print the newest N.S. Belt Head editions. Below are photos of the printing process. First of the two large blocks, setting up the Heritage Press in the NSCAD Printmaking department. After printing the first proof, François and I carved back into the linocut to make corrections to the original image. After 4 different proofs we printed the first time on 38x50 inch Stonehenge paper. This is the embossment on the back of the print. Paper alignment had to be fixed but otherwise we were ready to print a B.A.T. Detailed photos of the carving on the block before printing on the third day. Editioning the first N.S. Belt Head. I did all the inking on all the prints throughout the printing process. Finished Edition of 10, 1 B.A.T (Bon à Tirer) , 4 TPs (Trial Proofs) and several proofs on newsprint. Then we started proofing N.S. Belt Head 2, again carving back into the linocut to make corrections. Proof with red correction marks. François and I carving away. Editioning N.S. Belt Head 2. Detail shoots of N.S. Belt Head 2. One piece of newsprint for cushion. It took us a while to figure out the perfect way to lift the rather stiff Stonehenge paper without any smudging and shifting. All four corners at once. Finishing the Edition of N.S. Belt Head 2. Edition of 10, 2 Trial Proofs and several newsprint proofs. Next up we proofed four little belt heads. After the first proof, François decided he doesn't like the black background. Exciting things happen with the little belt head hanging out. A whole belt head family? Inking and proofing the little guys. The first Trial Proof of one of the little heads. DOERING editions is honoured to work on this extensive project with François and is excited for further projects. 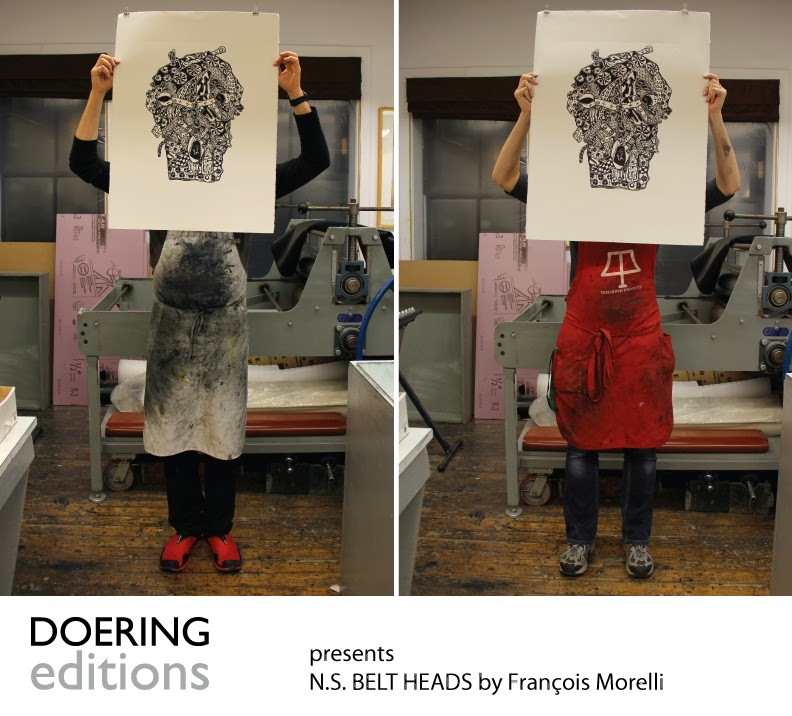 Thank you to François Morelli, the NSCAD printmaking department, the Anna Leonowens Gallery and everyone who stopped by to say hello during the printing process. It's been an adventure and pleasure!